We take one of our nativity sets and each day we hide a figurine somewhere in the house. The kids get to play a little hide and seek for about 10 minutes though sometimes we have a particularly good slueth and it’s over in 2 or 3 minutes. Of course the holy family is saved for the last 3 days with Jesus being found on Christmas/Christmas Eve. This year, we have incorporated another aspect to our Advent Family Worship. We have cut up red and green construction paper and put names, events, etc. on each one, then made a chain of garland, attaching it to our wall. Each night we take one link off and pray for whatever is written on it. I know that wasn’t original. What traditions do you do for Advent/Christmas? 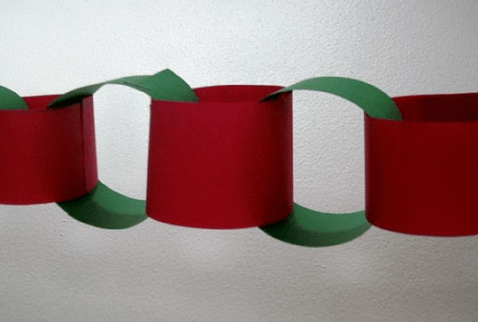 I remember doing paper chains like this as a kid.